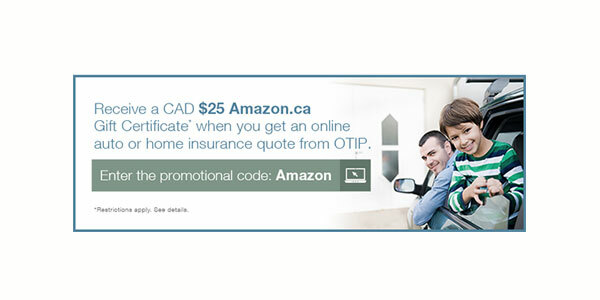 If your insurance policy is expiring in next 60 days, get an online auto or home insurance quote from OTIP today and you will be emailed a $25 Amazon.ca Gift Certificate*. Please enter the promotional code Amazon when you complete the online quote and choose “I’m interested: or “Let’s talk” in order to qualify for the $25 Amazon.ca Gift Certificate*. Visit www.otip.com/AmazonOffer to learn more.